Ever wanted an honest review of bodybuilding supplements? I thought I’d put together a review of some MyProtein products that I recently tested. Along with my experience with the supplement in question, I’ll also tell you whether or not I think you should check it out. Firstly, I got to taste 2 new flavours of Impact Whey: Mocha and Latte. You already know I’m a big fan of MyProtein’s whey, but I personally use unflavoured whey so this was a treat for me. Mocha. The first thing you’ll notice is the smell. It smells just like a ‘coffee cream’ sweet from a box of quality street 🙂 . Second thing is the taste. Again it’s just like the sweet but nicer; it’s not just as strong. If you’re a mocha fan, you’ll love it. You’re not going to drink this all the time, so I would get another flavour with it so you can switch it up. Latte. Absolutely delicious. Had this with water and it was still awesome. Since I’m a GLADer I usually have my shakes with full-fat milk. I can only imagine how this would taste with some whole milk action! One thing about MyProtein is that you definitely can’t fault their whey flavours! You also can’t fault their quality since they include the Certificate of Analysis confirming that the protein content is as advertised. I think that’s pretty cool. 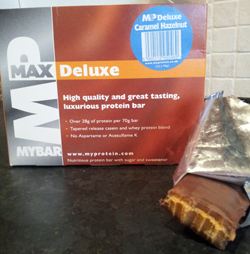 MP Max MyBar Deluxe. 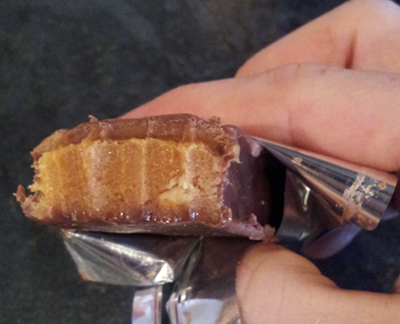 These caramel hazelnut bars pack 28g protein. While they are nice, I have previously purchased their Oats and Whey bars and would prefer them. While there is a little less protein in them per bar (22g), they are very tasty (especially chocolate chip) and are a good selection for GLAD dieters. Not a must, but convenient for when you’re on the go. Pill Box. Very handy indeed for setting out your daily micro-supplements. I put mine out at night so that I can’t forget to take them the next morning. The box contains five sections inside and shuts securely so your multi-vitamins, vitamin d, omega 3 etc. won’t spill out in transit. This would be a great addition for people that travel a lot. If you know you’re going to be in a hotel for a few days, take enough supplements with you in your pill box so you can’t forget about them. Oh, and it’s only 99p! Capsule Machine (Pill-Capping Machine). I was looking forward to this, but in the end it didn’t seem worth the effort. You can cap any powder with this machine. You might find this handy for particularly nasty-tasting powders like BCAAs or AAKG. However, after a quite messy affair, I decided that it’s worth paying a little extra to buy your gear already capped. Bedtime Extreme. A tapered night protein blend of Milk Protein Concentrate, Whey Protein Concentrate, Whey Protein Isolate, and Egg White Powder. Also contains L Glutamine and HMB (beta-hydroxy beta-methylbutyric acid) as anti-catabolic agents. I have to say I was really impressed with the quality of this product. It’s also quite low in fat and carbs. The flavour was great, (I tried chocolate mint) but you’ll notice the consistency is a little different from the regular whey. It’s a little more gritty, but you’d expect that from this particular blend of proteins. Do you need it? I would recommend this if you take a large portion of your daily protein close to bedtime. If not, I don’t think it’s necessary. If so, this is a great way to go. I’ll quite possibly be adding this to my own schedule for night time use from here on in. Beta Alanine This did seem to delay the onset of fatigue during my workouts, but the jury is out on this one for me. I took just 1g pre-workout and another 1g post-workout. There is at least 1 study that showed beta alanine supplementers gained an extra 1 lb of muscle over 8 weeks as compared to the placebo group. “Effects of β-alanine supplementation on performance and body composition in collegiate wrestlers and football players.“ It’s quite cheap so if you want to experiment with it, it won’t break the bank. £9.99 for 250g. Just a quick note that MyProtein has started using new packaging. 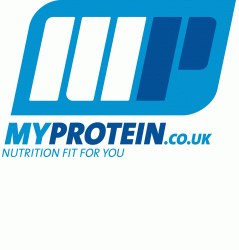 In terms of service, I’ve been a MyProtein customer for years and have yet to be disappointed. I’ve never had a late delivery, an incorrect item shipped, or been let down by the quality of their products. Add to that the fact that they’re the cheapest around and you can see why I wouldn’t go anywhere else for my supplements. While I certainly haven’t tried all their products (yet), I hope this helps you make better informed choices in the future. Beta Alanine WORKS for me, I know it. I have been able to push through reps that I otherwise would have failed on. I can tell that it gives me a boost of endurance. I can’t speak on it giving me more muscle or anything, but I live by it. I highly recommend that you take it more regularly than just before and after workouts. It says it takes 2 weeks of steady use to really get the sought after benefits. I take is in the morning, pre-workout(s), and post workout, though, I don’t think the post workout makes all that difference for endurance. I find that morning + preworkout gives me a boost. PS, you will get a prickly sensation when taking larger doses of Beta Alanine (like 1/4-1/2 teaspoon). The more you take, the pricklier you’ll feel. It’s completely safe, and I personally like the feeling because it’s feedback that the stuff is in my body and being processed. I don’t recommend taking large quantities. A little goes a long way. It also explains what the hell it does. I take one cap of the cheapos before workout, one with each meal. Hey mark I was woundering what you think of a product called finotrenbolone I friend of mine was telling me about it and I just wanted to know if you think its worth the money. How would you compare Quest bars to Mp Max bars? Thanks for everything you do!!! Yea, I pretty much take it the way you do. I think it’s important for people who don’t use it (yet) to know that it’s not going to be some dramatic thing where you’re throwing 20 pounds on your next workout or pumping out 12 reps when your last set was 8. But, I notice that It gives an edge which might provide you with one or two extra reps and overall not feeling as exhausted during your workouts. It’s not a miracle like roids or anything. But, if I had to choose, I’d pick it over creatine any day. And no … I have to sponsorship/endorsements with this company. I just like to find a cost-effective but high quality protein. These guys deliver (no pun intended – as delivery is free for over $99). Check them out. @Jack. It’s pretty much impossible to totally eliminate all sugar. Even on TSPA, you can have some sugar within your daily carb limit. @Andrew @John. Thanks for the beta alanine feedback. @Dale. Probably go for Quest on that one. I’m interested in beta-alanine so I may give that a try. Cheers! Mark, what is your take on pro-hormones? I have tried all different kinds of protein..BSN vannilla ice cream is my personal favorite. Twin lab is probably the best deal..about 35 bucks for a 5 pound container.. I agree with Zipper. in the U.S., Optimum Nutrition gold standard is the best. As for Beta Alanine, it does give me a better workout. I’ve kept track of workouts with and without Beta Alanine. They are better with. As for bedtime, I still take 1 scoop of ON Casein and their ZMA. They have both made a big difference in muscle gains, plus Great MuscleHack Workouts!! Thanks Mark!! @mikey. They cross the natural line for me, so I don’t know a lot about them since I wouldn’t consider taking them. Basically they’re an attempt to trigger your body to produce more anabolic hormones. I don’t think they’re very effective at doing so, but I guess you might get an effect similar to taking a very very weak steroid. Before this post, I had an idea that I was going to put to you, but it seems even more appropriate now. The idea was to ask all hackers who take supplements to post what they’re taking and how and what affect it has had on them and their progress and any side affects that they may have experienced. All this info’ could then be collated and an extensive library of supplements and their effects on the people taking them and in what doses would then be available to say all people who have registered with the site, so we can all benefit from each others collective experience! Graham, I think they call that idea “Bro-Science”… 🙂 Interesting idea, but I think something called the placebo effect has to be weighed in to. Just because you take a supplement and ‘feel’ it works after you take it, is not always attributed to the contents of the supplement.